No matter what size your company, communication is key to your success. As the size of a business grows, so does the cost and complexity of your communication system. That’s why we offer complete telecommunication solutions for your business. We have a range of PABX and telephone management systems suitable for a variety of business requirements. These systems are simple to use, offer sophisticated digital communicating and monitoring, and will save you money. Contact our telecoms specialists today and transform your business into the efficient company you’ve always envisioned. If you are unhappy with your current phone system, think you are paying too much, or find telecoms frustrating, contact our knowledgeable consultants. We have partnered with numerous established brands and offer an array of switchboard systems and communication telephone systems for small and large businesses. Our solutions are designed to be simple to maintain, and are highly cost effective. We’ll take time to explain the system to you, and provide training to your staff to help them adapt quickly and easily to the new system. We offer versatile telecommunication solutions that suit all environments helping you achieve your business goals. We have partnered with major brands Samsung and NEC. Through these strategic partnerships we are able to offer you a higher level of service and top quality products at competitive prices. These products include phone systems, Samsung and NEC telecoms, renowned for their cost effectiveness and durability. Our goal is to take your business to the next level on the telecommunication front and provide you with cost effective, low maintenance solutions. Through our experience with many companies in the Western Cape, we know that we can save you up to 30% with a new phone system. Contact us and we will provide you with a free assessment of your telecoms system with no obligation. Epygi Technologies, LLC, a worldwide provider of award-winning IP PBXs, Gateways and ecQX Cloud Services, supporting small businesses to enterprise’s telephony needs, is a private US company founded in 2000 and has its headquarters in Winter Park, Florida. Reliable, secure and easy to install and use, the Epygi products offer users outstanding benefits and an unparalleled range of features at very economic prices. Customers are able to improve their productivity, lower operating expenses and enhance their image while affording the latest in telecommunications equipment. NEC telecoms offer value-for-money systems, which can be tailored to your company’s unique requirements. The system is designed to help you boost productivity, improve customer service and reduce your telecommunication costs. Download the brochure. Whether you are looking for a VOIP system, telephone management software that works with your existing hardware or a new telephone system, contact our Telecoms Specialists at CBA. NEC VOIP phone & PBX systems – Smart communication for your business. Work smart, not hard. With technology and traditional communication systems overlapping with more intensity and frequency, companies are realising that they can get more for less. CBA, in partnership with NEC South Africa, offers value-for-money communication systems for any type and size of business. Whether you employ 2 or 2000 staff, we can tailor a VoIP phone system to suit your business’s unique needs. Software-based telecommunication will improve productivity and reduce your telecoms costs. 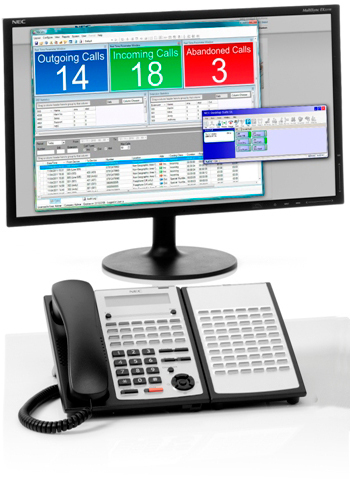 Contact us for a free assessment of your current phone system. If you are a growing small or medium sized business, a NEC VoIP phone system is the most cost-effective way to expand your business. The system can be customised to your needs allowing for easy expansion when needed. CBA is a leader in the local technology industry, offering a range of office automation products and services. This includes office printers, automation software and telecommunication systems. Our office solutions are designed to make your office more productive and more cost effective at the same time. By investing in technology you invest in your company and your staff, allowing you to take your business to the next level, become more efficient, and ultimately increase profits. Contact CBA today.